Through a combined approach integrating RNA-Seq, SNP-array, FISH and PCR techniques, we identified two novel t(15;21) translocations leading to the inactivation of RUNX1 and its partners SIN3A and TCF12. One is a complex t(15;21)(q24;q22), with both breakpoints mapped at the nucleotide level, joining RUNX1 to SIN3A and UBL7-AS1 in a patient with myelodysplasia. The other is a recurrent t(15;21)(q21;q22), juxtaposing RUNX1 and TCF12, with an opposite transcriptional orientation, in three myeloid leukemia cases. Since our transcriptome analysis indicated a significant number of differentially expressed genes associated with both translocations, we speculate an important pathogenetic role for these alterations involving RUNX1. Translocations involving RUNX1 are known to decrease the function of the encoded protein in myelodysplastic syndromes (MDS) and acute myeloid leukemia (AML) . For those involving chromosome 15, SV2B was the only RUNX1 partner gene identified in AML . We report on two novel t(15;21) alterations leading to the concurrent disruption of RUNX1 and SIN3A or TCF12 (Additional file 1: Table S1). Another interrupted gene is the UBL7-AS1 long noncoding RNA gene. In case 1, FISH experiments (Additional file 2: Table S2) mapped the breakpoint on der(21) within intron 7 of RUNX1 (Additional file 3: Figure S1A-C). Moreover, SNP array analysis identified a 908-kb deletion near the 15q breakpoint on der(15) (Additional file 4: Table S3 and Additional file 3: Figure S1D-F). Genomic PCR revealed that intron 7 of RUNX1 (chr21:36194775) was joined at intron 3 of SIN3A (chr15:75708434) (Fig. 1a and Additional file 5: Table S4) on der(21). Furthermore, intron 7 of RUNX1 (chr21:36194861) was fused to the inverted sequence of UBL7 (NM_032907.4) at intron 1 (chr15:74751664) on der(15), suggesting that a submicroscopic inversion accompanying the translocation led to the juxtaposition of RUNX1 and UBL7-AS1 with the same transcriptional orientation (Fig. 1a). ChimeraScan analysis of RNA-Seq data identified the fusion of SIN3A (exon 3; NM_015477) to RUNX1 (exon 8; NM_001754) and of RUNX1 (exon 7; NM_001754) to UBL7-AS1 (intron 1; NR_038449.1). Both chimeric transcripts were validated by RT-PCR (Fig. 1b and Additional file 6: Table S5). In silico translation of the in-frame 5′-SIN3A/3′-RUNX1 showed two ORFs of 171 and 163 amino acids, respectively, the first one retaining the transactivation domain of RUNX1 (Fig. 1c). The out-of-frame 5′-RUNX1/3′-UBL7-AS1 encoded a protein of 373 amino acids, showing the substitution of RunxI with a GVQW putative binding domain (Fig. 1d). Thus, both chimeric SIN3A/RUNX1 and RUNX1/UBL7-AS1 encoded for truncated SIN3A and RUNX1 proteins. Interestingly, RT-qPCR revealed that the full-length RUNX1 (NM_001754) and the 3′ portion of SIN3A (NM_015477) were downregulated (Fig. 1e), whereas UBL7-AS1 was overexpressed (Additional file 7: Figure S2). Further, we evaluated the molecular impact of these fusion transcripts through a differential expression analysis, using the control datasets of 19 AML cases with normal karyotype from the The Cancer Genome Atlas data bank (http://cancergenome.nih.gov/). The results obtained by the QIAGEN’s Ingenuity® Pathway Analysis (IPA®, QIAGEN Redwood City) , following the Partek Genomics Suite 6.6 (Partek Inc., St. Louis, MO, USA), indicated a significant number of differentially expressed genes within the AML pathway. 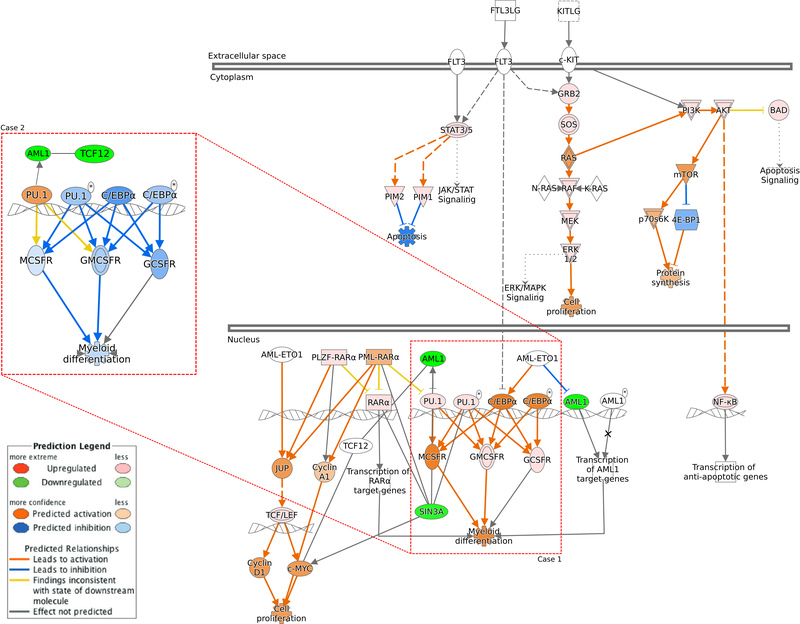 The cell proliferation and myeloid differentiation pathways were significantly activated, whereas apoptosis exhibited reduced activity (Additional file 8: Figure S3 and Additional file 9: Table S6). The results obtained in case 1 clearly suggest a role as a tumor suppressor (TS) gene not only for RUNX1 (the shorter RUNX1 encoded by the chimeric RUNX1/UBL7-AS1 should behave as a dominant negative mutant of the wild-type RUNX1), but also for SIN3A. We speculate that the inactivation of both proteins should have led to an abnormal activation of RUNX1/SIN3A target genes, leading to myelodysplasia. Even if haploinsufficiency was never reported for SIN3A, its role as a TS has been described in other tumors . Notably, the SIN3A corepressor was known to interact with RUNX1 , leading to the transcriptional inactivation of their target genes . In cases 2 and 3, FISH indicated that RUNX1 was interrupted within intron 7. Additionally, in case 4, a 600-kb deletion removed the 5′ portion of RUNX1 starting from intron 6 (Fig. 2a and Additional file 1: Table S1). In all cases, RUNX1 was joined with an opposite transcriptional orientation to intron 3 of TCF12 (NM_003205), a basic helix-loop-helix transcription factor (Fig. 2b) fused with MLL in MDS  and recurrently mutated in myeloproliferative disorders . Notably, in case 2, RT-qPCR indicated the downregulation of both RUNX1 and TCF12 (Fig. 2c) and IPA analysis disclosed significant deregulation of the AML pathway. The number of altered pathways was slightly higher than in case 1 (146 vs. 136) and mostly overlapped the previously described categories. Particularly, RUNX1 was shown to control many differentially expressed genes involved in cell cycle regulation, inflammatory response, and transcription regulation (Additional file 8: Figure S3 and Additional file 9: Table S6). We thus suggest a TS role for TCF12 in myeloid disorders, as already described in colon carcinoma . The concurrent inactivation of RUNX1 and TCF12 should mimic the same leukemogenic effect of the t(8;21) RUNX1/CBFA2T1 fusion protein. E proteins, like TCF12, are inactivated through their interaction with the domain TAFH of CBFA2T1, leading to the inhibition of the p300/CBP histone acetyltransferase recruitment at their target genes’ promoters and consequently to the lack of activation of genes with E-box promoters . To summarize, we here identified three novel RUNX1 partner genes, including two transcription factors and a long noncoding RNA, in 2 t(15;21) translocations. Both of the t(15;21) translocations resulted in the concurrent inactivation of RUNX1 and one related transcription factor (SIN3A or TCF12), leading to the potential haploinsufficiency of both involved genes. Moreover, the IPA analyses clearly indicated that the AML pathway was significantly deregulated in our samples, and showed that RUNX1, SIN3A, or TCF12 have a crucial impact on differentially expressed genes. The analysis of additional cases harboring t(15;21) translocations will be helpful to better understand the pathogenetic impact of these alterations in myeloid neoplasms. This study was performed in agreement with the Declaration of Helsinki, and approved by the Ethical Committee at the “S. Martino” hospital, Belluno (Italy); Centre Hospitalier Universitaire Vaudois CHUV, Lausanne (Switzerland); University Hospital Leuven, (Belgium). Alberto L’Abbate and Doron Tolomeo contributed equally to this work. This work was supported by Associazione Italiana Ricerca sul Cancro (AIRC MFAG2011 No.11405 to CTS). ALA performed bioinformatics analysis, analyzed all data, and wrote the paper; DT performed FISH analyses, molecular experiments and wrote the paper; FDA and AL performed FISH analyses; CLC, DM, JS, PV, and AVH prepared samples for FISH and molecular analyses, and provided clinical data of the patients; OP and MC performed SNP array CGH analysis; TM performed bioinformatics analysis; CTS reviewed all the data, and wrote the manuscript. All authors read and approved the final manuscript. Ingenuity Pathway Analysis IPA® QRC. http://www.qiagen.com/ingenuity.